A genuinely exciting pedalboard development. Screen is a little small. Not the best choice for onboard drive sounds. Pro pedalboards are increasingly based around almighty switching systems, designed to swap stompboxes in and out with ease. Yet for those of us looking to minimise on real estate (and outlay), Boss has come up with an ingenious solution that gives you programmable loops for three of your own pedals and a host of its own effects - 112 to be precise. The MS-3 can switch your amp channels, adjust external effects and integrate with MIDI-equipped pedals. Then there’s the built-in tuner, noise suppressor and global EQ. It’s as if Boss looked at everything players could want from a pedalboard controller and crammed it into one compact unit. Integrating the MS-3 in your rig takes a bit of setting up: hook up your external pedals of choice around the rear via the trio of send/returns, then use the buttons and three knobs to choose which of the MS-3’s footswitches switch the pedals in and out (manual mode), or which are active in the current patch (memory mode). The same goes for internal effects. Amp channels and MIDI setup require some deep-menu diving, but once the MS-3 is ready to go it’s a dream to use. There are 200 patch memories for saving your expertly tweaked sounds, each with four effects or pedals that can be switched in or out at will, or four presets that can be instantly recalled. Want a fuzz for your solo, with adjustable tap tempo for the delay and momentary flanger control? Fine. Need to swap three of your fave stacked drive pedals out for a compressed clean with reverb and chorus, all with a single tap? No problem. 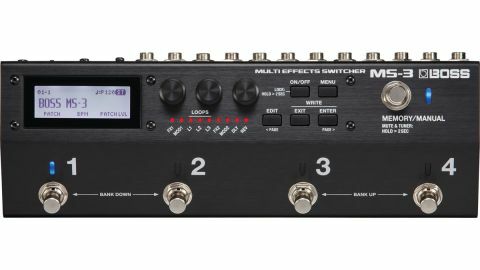 For anyone who hasn’t used a loop switcher before, the potential is limitless, and it’s backed up by typically high-quality Boss tones. The MS-3 is rammed with pristine modulations, all the essential delay and reverb types, as well as a load of Boss specials, such as the dynamic Tera Echo and sequenced tremolo Slicer. Then there’s the niche yet useful effects, such as an acoustic guitar sim, Slow Gear auto fade-in and that sitar sim you never knew you wanted. The drive tones don’t live up to standalone pedals, but for most players, we’d wager those three switchable loop slots will be used for analogue drives, with the ES-3 handling modulation, delay and reverb. Complaints? The small screen that makes setup a little fiddly, the tight jack spacing around the rear - are negated by its size, which ensures it’s small enough to fit on any pedalboard. With a huge range of killer tones and cunning switching functionality, it’s a genuinely exciting pedalboard development.